E-METER: Short for electropsychometer, a specially designed instrument which helps the auditor and preclear locate areas of spiritual distress or travail. 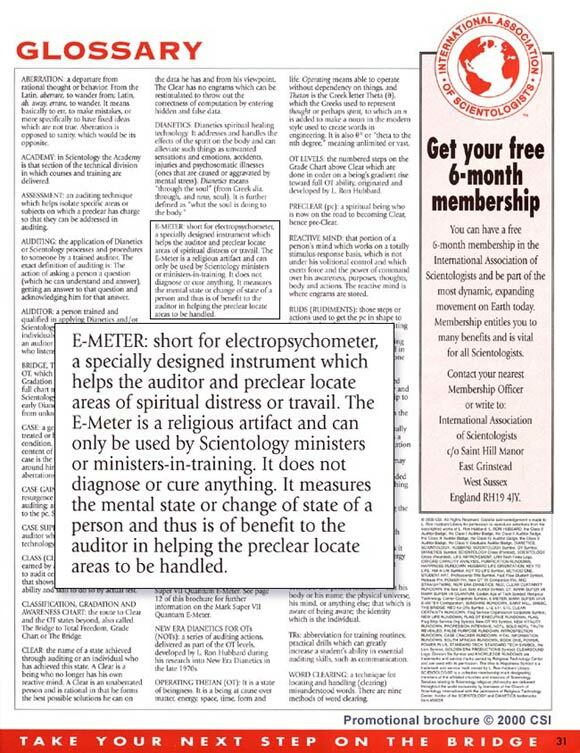 The E-Meter is a religious artifact and can only be used by Scientology ministers or ministers-in-training. It does not diagnose or cure anything. It measures the mental state or change of state of a person and thus is of benefit to the auditor in helping the preclear locate areas to be handled. CSI (2000). Glossary, Promotional brochure. ELECTROPSYCHOMETER, it’s an electrical means of measuring the spirit. It’s exactly what its name says, electropsychometer. It’s called for short, E-meter. (Class VIII, No. 7) See also E-METER.